[PDF] Black & Decker The Complete Guide to Roofing Siding & Trim: Updated 2nd Edition, Protect & Beautify the Exterior of Your Home (Black & Decker Complete Guide) | Free eBooks Download - EBOOKEE! Description: The best home insurance policy you can buy The single worst enemy to any home is the weather. Even tiny breaches in a homeâ€™s exterior can lead to thousands of dollars in damage if water invades walls and ceilings. To protect families and guard investments, this book provides all the information homeowners need in order to maintain, repair, and install all types of roofing, siding, and trim. Roofing and siding installations professionals will also find this to be an indispensable source of state-of-the art information. 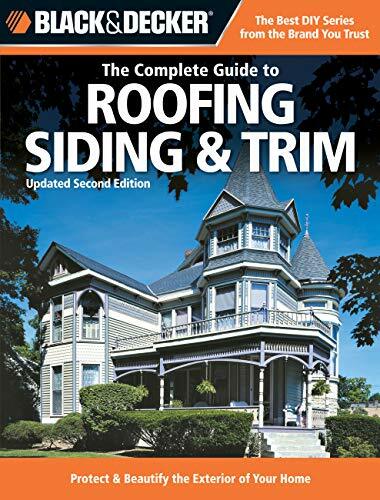 The Complete Guide To Roofing, Siding & Trim covers all traditional materials, from traditional wood lap siding, brick, concrete block, stucco, stone veneer and wooden shakes, to vinyl, raised metal roofing, and cementitious sidings. Important new tends in materials, like EPDM, architectural, fully bonded selvedge edge and pyramid shingles, are also discussed. In addition to complete installation information, the book includes comprehensive methods for repairing problems with existing surfaces, as well as routine finishing and refinishing information. No comments for "[PDF] Black & Decker The Complete Guide to Roofing Siding & Trim: Updated 2nd Edition, Protect & Beautify the Exterior of Your Home (Black & Decker Complete Guide)".